I love the open road. Most of my friends don’t understand the depth of my passion for wide-open spaces and miles of pavement in front of me. From the time I left high school I was road-tripping down the west coast of the US from Seattle to visit friends in California, Oregon and Utah. 15 hours of nothing but tractor-trailers and roadside gas stations was easy in those days, always fuelled by Mt Dew soda and the worst junk food I wouldn’t dare feed my kids these days. While my endurance has shifted, my love for driving around the vastness of the American west has not. But it’s not all emptiness and diner food. This part of the country has lots of offbeat, lesser-known attractions (which I love finding anywhere I go). Here then are some of my suggestions for alternative things to do throughout the key west coast roadtrip hot spots. 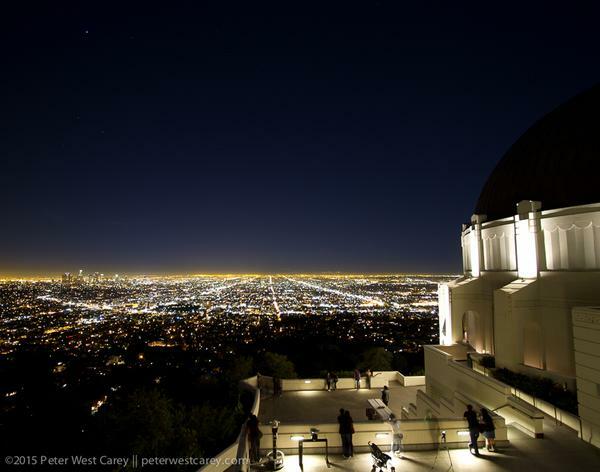 The Griffith Observatory – LA is in a valley, but the Griffith Observatory gives visitors the chance to rise above it all. The grounds are free and so is parking. On a clear evening the city and all the valley below are laid out like a scene from Tron as the straight streets make for an amazing study in diminishing perspective. I suggest heading to the observatory just before sunset and maybe enjoying a picnic as the city lights come on. The observatory also has some fabulous astronomy exhibits and is great for the whole family. The city lights of LA from the Griffith Conservatory. Hike The Hollywood Sign – The bummer about hiking to the Hollywood sign is you can’t take a satisfying selfie no matter how long of a stick you brought as the landmark is protected by a fence and active cameras. But it is a great leg stretcher if you’ve been on the road all day. For the long version of the hike (6.4km [4 mi] each way), park on the far east side of Griffith Park. Make an afternoon out of a hike to the Hollywood sign. Tar Pits and Art – La Brea Tar Pits and the Page Museum are located right next door to the Los Angeles County Museum of Art (LACMA). Both offer different experiences with LACMA displaying an array of modern and classic art from around the world and locally. The tar pits are a fascinating look into the past and are currently an active archeological dig right in the heart of LA. Indeed, it was the recent find of a largely complete mammoth skeleton discovered while digging new parking space for LACMA that reignited the excitement and activity at the Page Museum. Night Time Exploring – Yosemite Village is one of the most developed sections of land in any of the large national parks but a short ten-minute walk will allow you to be bedazzled by the billions of stars on display. 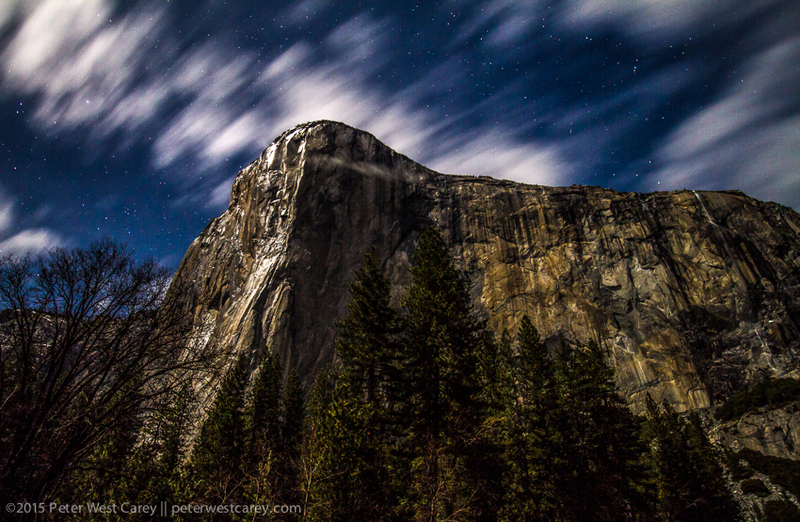 If the moon is out the valley turns magical as waterfalls and rock faces take on a quiet, mystical look. No special equipment or skills needed; just walk outside after the sunset and take it all in. Watch magic appear when the sun goes down. 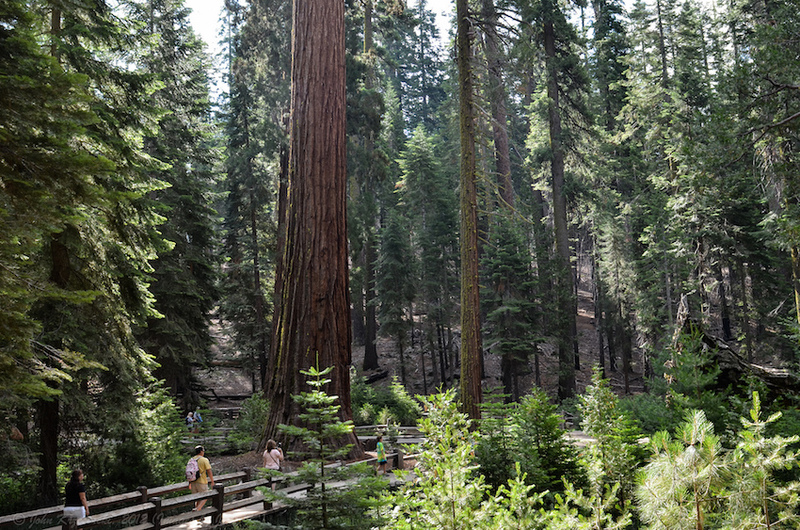 Mariposa Grove – While most people know Yosemite for the monolithic rock formations in Yosemite Valley, many are surprised to find some of the largest trees on Earth are just an hour’s drive away and well within the park boundaries. Indeed, the park was established to protect the valley and this magnificent stand of sentinels. Take the bus from the valley and save the headache of finding parking at the smaller lot, then wander the miles of paths until you’ve had your fill. Sequoia trees in Mariposa Grove. Photo courtesy John K.
The Ansel Adams Gallery – If you love Yosemite because of the classic black and white images you have seen over the years, treat yourself to the finest art in the park. Not only does the Adams exhibit his work, but that of more than 20 other artists also. In addition, the gallery offers photography instruction and guided photo walks to prime locations in the best light. Golden Gate Park – The park is more than just the famous bridge. While not an easy site from the downtown core where most tourists hang out, it does offer a nice getaway and far more local flavour than the waterfront. Its carousel and flower conservatory make it a great place for kids to play. 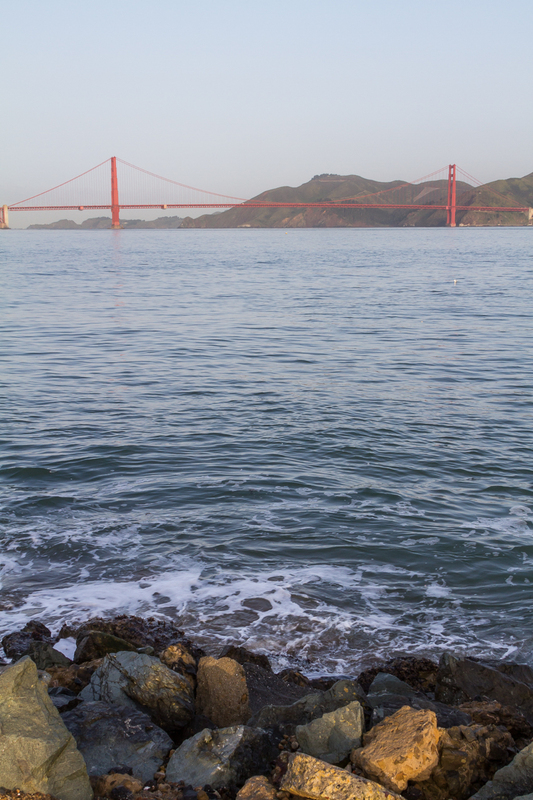 A Japanese tea garden, aquarium, California Academy of Sciences, and a contemporary art museum make the park a full day’s destination even if you don’t make it to the fabled bridge nearby. The fabled Golden Gate Bridge. The Exploratorium – This place will have you feeling like a kid in a mad scientist’s lab. While it’s great for kids, I remember going here as an adult and being fascinated with the well-crafted exhibits and the sheer size of the place. If you or your kids love science or just have a curiosity about every day mysteries like “What’s really going on when you bake bread?”, this place can devour two days of your imagination if you let it. Okay, Fine, Ride A Cable Car – Even the part of me that avoids being too touristy when travelling can’t avoid the cable cars when in San Francisco. I suggest catching a ride early in the morning when the service opens to both avoid tourist crowds and to get a feel for the city as it wakes up. The cars can be bumpy and don’t make the best photography platforms so I will often tuck my camera away and smile gleefully like a kid in a candy store. They’re just a lot of fun. Catch the Sunrise – You just can’t go wrong with a sunrise view of the Grand Canyon. The cliffs show their vibrant colours better in the morning (and evening just before sunset) and the long shadows really show off the depth and size of the canyon such as you won’t get in the middle of the day. If you’re not an early bird, you can catch a sunset, but for my money, a summer sunrise, when the sun is farther to the north, is where it’s at. Here’s a list from the National Parks Service of great viewpoints along the rim. Golden hour at the Grand Canyon. Ride the Rails – For over 110 years the Grand Canyon Railway has been in service and these days it offers a unique view of the area surrounding the Grand Canyon. Catch the train in Williams, Arizona, less than a half hour from Flagstaff and ride for approximately two hours and fifteen minutes to reach the rim of the Grand Canyon. You will have a good four hours to explore the park before the return trip departs. The train has luxury coaches with domed view cars that offer panoramic views even before you reach the Canyon. 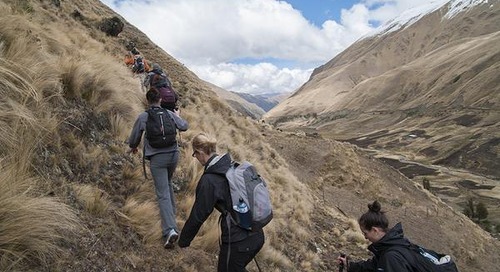 Hike it – Been in the car too long and really want to stretch your legs? If you have a whole day or even a few days, hiking the Grand Canyon is a tough but rewarding experience. Hands down the best starting place for info is the National Parks Service’s page located here. It will let you know what you’re in for and how to prepare. And take it seriously! This land is rough and raw and your cell phone likely won’t work once below the canyon rim. 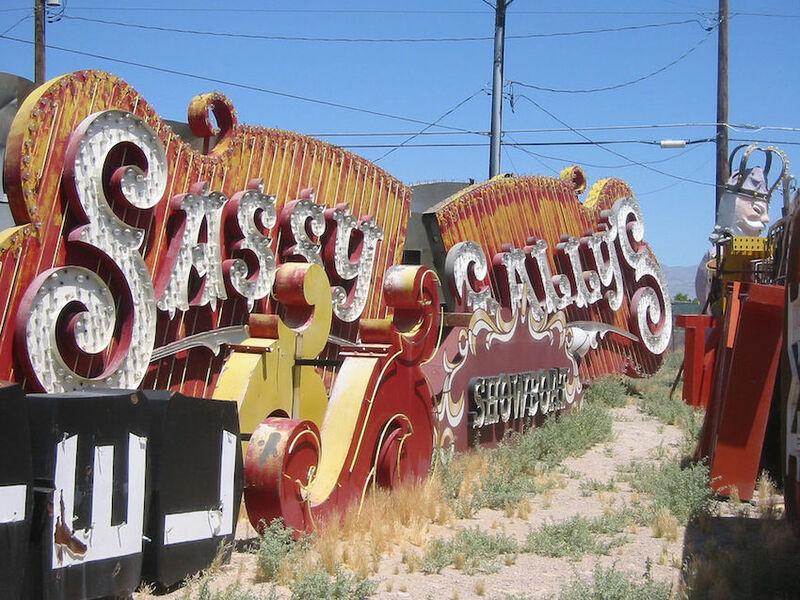 Neon Boneyard – What happened to all those neon tubes and displays from old Vegas as the new hotels began to spring up? Welcome to the Neon Museum of Las Vegas. The museum features some great signs but if you want to see the bulk of the collection, head outside to the boneyard. Photo tours are offered for those so obsessed. Neon Boneyard in Las Vegas. Photo courtesy Planet Gordon. Red Rock Canyon National Conservation Area – Way, way off the Strip is the natural beauty of the desert at Red Rocks National Conservation Area. It’s only a 20-minute drive to the east of town and provides a vast array of Mojave Desert flora and fauna. Hike, bike, camp, climb, ride your horse or ATV, the area offers opportunity for an array of activities, including stargazing when the glitter of the strip has become too much. Mob Museum – Where there’s money and a racket to be run, there is the mob. The museum is in downtown Las Vegas and offers a variety of exhibits, from showing the mob’s history both inside and outside of Vegas to notable characters to organized crime around the world. It’s a whole other world most of us don’t think about when we visit Las Vegas but it has always been there beneath the surface and is worth a look. We don’t hear much anymore about iconic road trips through the American west, but this massive expanse of land still provides some incredible experiences for anyone looking for a different kind of trip. These places provide great memories that every traveller should have the chance to experience. Experience it for yourself on the Best of the West trip with G Adventures. We’re thrilled at the prospect of showing you this big blue planet of ours — check out our small group trips here. Stand in the middle of the evening’s action in Lima's Plaza Mayor.